In infants and toddlers (<2 years), the face, scalp, torso and outside area of the limbs are affected with itchy, red, weeping or scaly area. In older children and teens, eczematous lesions are more notable in the folds of the knees and elbows, and inside the wrists, ankles and neck. Eczema in older children often becomes “lichenified”, meaning the skin becomes thicker and looks more leathery. 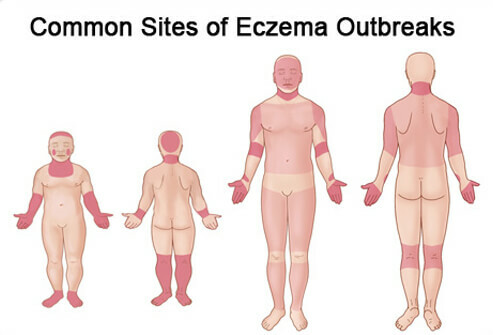 In adults, eczema generally becomes more localized to specific areas – the hands, the face etc. Sometimes eczema is triggered or worsened by certain soaps or foods, and it’s important to try and make note of any potential triggers. It is important to check for a food allergy in any children who have had an immediate allergy to a food, or when the eczema is not controlled by optimal eczema treatment. Often, mild to moderate eczema can be managed at home, by removing products that worsen eczema and using the correct creams. 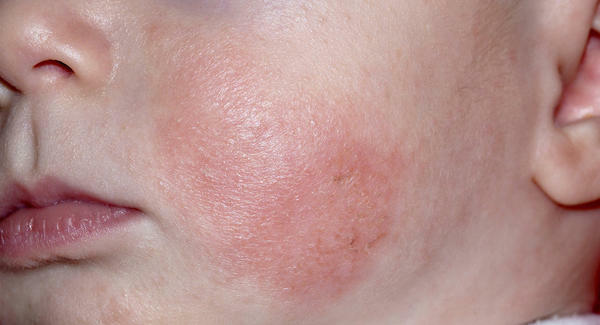 Eczema lesions can become infected. This will need to be seen by a doctor, and either an oral or topical antibiotic will be prescribed. My approach to eczema is described below. This can be tried and tested at home, and if no improvement is seen, then a doctor’s visit is warranted. Change washing powders and/or stop fabric softeners. Fabric softeners should not be used on the clothes of anyone who suffer from eczema. You can try washing just with washing powder alone, and if the eczema still persists/is severe, then try a hypoallergenic powder (Like Sunlight Baby, which comes in a blue box) or a natural washing liquid like Triple Orange. I love the Triple Orange product – it’s made from citrus oil, no fabric softener is required, and your clothes smell divine. Use aqueous cream as soap, or an aqueous bar. As soon as you are out the bath, pat your body dry with a towel (don’t rub) and apply an emollient onto the whole body. Examples of emollients are Epizone E, Aquabase, Epimax Ultra and liquid paraffin. They can be quite hot in summer, and if you really struggle with sweating/heat when using the emollient, you can try mix half aqueous cream with half emollient, or apply the emollient to the affected areas only, and moisturize the rest of the body with an unscented, aqueous/emollient based cream – like Epizone A, or Epimax. You can also try just put the emollient on at night and moisturize with the cream in the morning. Whenever you feel the affected areas become dry, reapply the emollient to those areas throughout the day. You can apply it as often as needed, even if that is 25 times a day! The goal is to “lock in” as much moisture as possible. If your baby is formula fed, you can try change to a hypoallergenic formula. It can make a difference for some babies, but the formula is not always a trigger factor, so it may not make a difference. There are a few brands that make hypoallergenic formulas. Try stick to 100% cotton clothes and blankets. I often see babies suffer worse in winter as they are wrapped in lovely fluffy polyester or nylon blankets and onesies. As soft as these are – they are not good for babies with eczema, as the artificial fabric is not breathable. Rather use only 100% cotton, and in winter layer with multiple flannel blankets and layers of cotton clothes when it is cold outside – rather than one fluffy polyester blanket or onesie. Often, mild to moderate cases of eczema will be controlled with the above measures. The effect will not be seen overnight, but rather within a few days to weeks. It is important to continue with the regimen even when the skin has cleared to normal. If no improvement is seen within a week or two, please come see us at Mediwell. There are several prescription medications that can help.